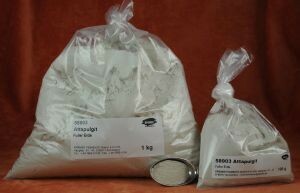 Attapulgite | Thickeners | Fillers & Building Materials | Kremer Pigments Inc.
Gray rottenstone. Used in a watery paste on stone sculpture, absorbs surface pollution when drying. Contains magnesium-aluminum, hydro-silicate.